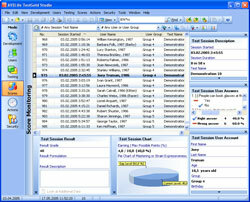 Main features: complex test format with support of 12 types of questions and multifactor psychological tests, powerful built-in text editor, providing advanced formatting of questions and answers, flexible 3-Variant Data Storage Engine with opportunity to connect to power database servers, such as Microsoft SQL Server, Oracle or any other database by means of ADO technology. Moreover, numerous ready psychological tests and assessments are available for use. Thanks to special freeware light-weight agent for testing, nowadays TestGold technology is one of the most cost-effective professional solutions for educational and psychological testing. Now you can import user and access accounts from CSV-file.